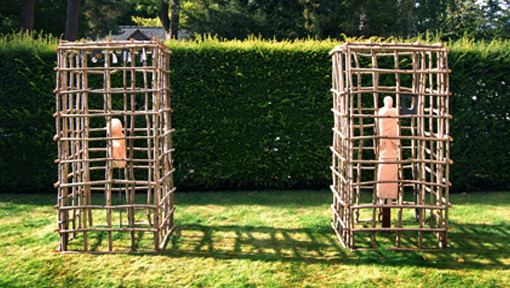 Two hazel cages standing six foot high. One cage holds a suplicating figure – his exit is a heart. The other cage houses a new-born child. Ablank canvas to write upon – the infant’s ‘shower’ gifts are brand-named consumables that will influence choices made in life. Click on the image above to watch a short movie clip of the sculptures. I’ve had regular solo shows since 1988, but here is a small list of larger installations since 1993. ‘Messengers’ at MOMA, Machynlleth, Powys 1993. This took up most of the gallery on two floors. 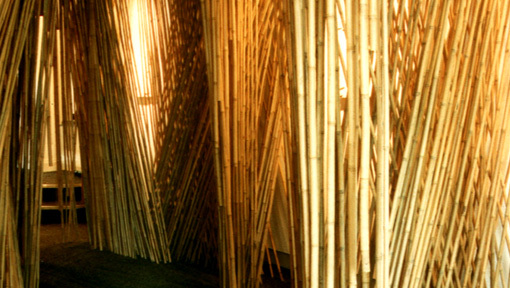 On the ground floor one had to negotiate a labyrinth of bamboo [some 3000 pieces] from floor to ceiling in the shape of seven individual chapels, housing a different stone angel in each. This was accompanied by a forty-five minute ‘soundpiece’ I’d written and recorded, using surround-sound speakers. Upstairs were over seventy five pieces of artwork [mainly 2D] integrated by pastel drawings made directly onto the gallery walls. 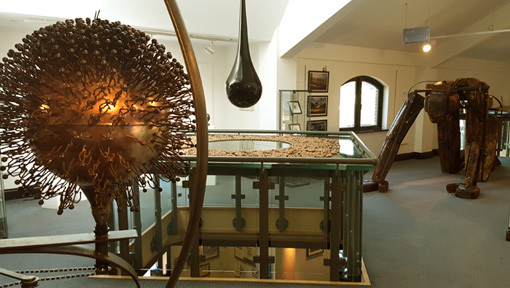 Installation/exhibition based on the life and work of Alfred Watkins, who lived and worked in Hereford city at the start of the twentieth century. I was collaborating with the writer Christine Watkins and video-maker Richard Urbanski for this show. I was resposible for the visual design of the installation and all artworks assembled there. 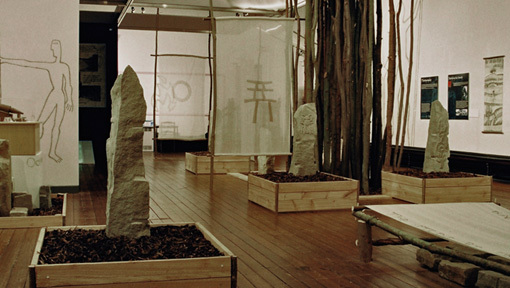 The exhibition consisted of seven standing stones, with muslin/timber frames, wall drawings and 2D photos/graphic information boards. We also had budget to produce our own posters/invitation cards and a booklet of work based on Alfred’s life. There are examples from this show in the link ‘An album of past exhibitions’, below. Hereford Museum and Art Gallery 2013. An installation/exhibition based on the notion that stone [or anything having Silicon in it’s makeup] can hold stories/events from the past that can be re-lived if you have the power/skill to do so. This ficticious concept is also the subject of a graphic novel ‘Mig Dante – stonereader’ which is illustrated under the page ‘books’ on this site [see ‘Other Stuff’ in the main menu]. Huge drawings on the walls of the gallery. A muslin entrance tunnel of sixty feet. A willow ‘cage’, housing most of the stone sculptures. 3D interlocking ‘drawings’ suspended from the ceiling. Hung muslin sheets, to which were sewn drawings describing stories and ‘memories’ related through touching stones at various location/times. Images from the show are included in the link below … ‘An album of past exhibitions’. Click on the image above to see an album of photos/images from prevous exhibitions and installations. 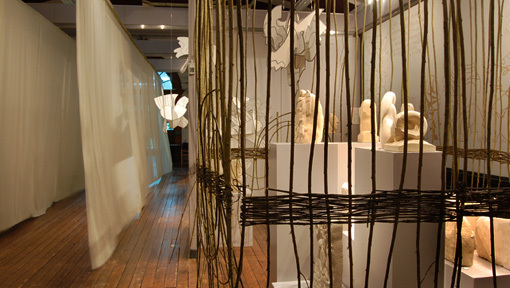 my first big show was at the MOMA in Machynlleth, entitled ‘Messengers’, on the subject of angels. I seem to have done a large-scale show every ten years [on average] which sounds reasonable, to me, because of the amount of work needing in setting such a project up!